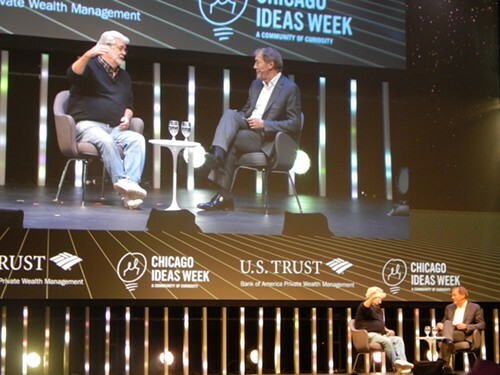 George Lucas was the third and final speaker at the last session of Chicago Ideas Week's "Edison Talks" event at the Cadillac Palace Theatre on Friday. The event had a pep-fest vibe, with spotlights strafing the audience and the volume turned way up on the Blue Man house band. After a cringeworthy monologue by Naomi Judd, and some solid advice (do your own work every day and be smart about who you hang out with) from television writer and producer Mara Brock Akil, Lucas sat down for a friendly Q&A with Charlie Rose. Lucas: I've collected art ever since college, starting with comic art and moving up to illustrative art, and I realized there was no showcase for this work. After four years, San Francisco decided they didn't want to build a museum [and] I happen to be married to a woman who was born and raised in Chicago. 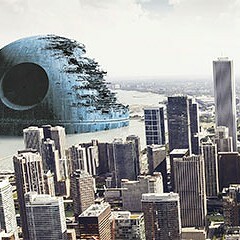 [Also] the mayor said, "This is a great idea for Chicago." What'll be in the museum? It's an illustrative art museum and also a cinema museum and a digital arts museum. We'll have a regular cinematique. We'll be able to show all kinds of movies and have lectures. Another area will show the things that are made to go into a movie: sets, props, costumes, fashion. 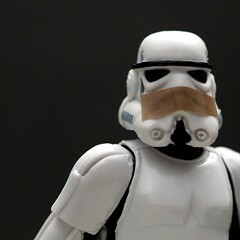 There will be Star Wars artifacts there and [artifacts from] other movies, not just mine. Your website says you want to challenge the way people think about museums. Most narrative art is not seen in museums—we'll have illustration, comic-book art, children's art, pin-up art, and we'll also have a section on the history of narrative art. Is it going to have some of your collection? I'm using my collection, and I'm in the process now of getting a director and curators. They're going to build up the collection so that it represents the whole idea of narrative art. When you went shopping for an architect, what were you looking for? Originally, in San Francisco, I wanted to build an iconic building. San Francisco said absolutely not. You have to have something that looks it belongs there. So I came here, the first thing I said to Rahm was I warn you, I want an iconic building—something nobody's ever seen. Something avant-garde, leading edge. As soon as they heard that you might not go to San Francisco, Chicago came running. Yes, Rahm and Chicago. There was a little prodding from my wife. But they knew a good deal when they saw it. This is a very big, expensive museum, completely taking care of itself. I'll pay for the whole thing, and an endowment, and everything. Do you see yourself as a standard bearer for narrative art? The great thing about narrative art is it's designed for the people. It's not an elitist art at all. It tells people what the community believes in, who the heroes are. It's always been huge and important, but once you got to the 20th century, it got diminished. I'm taking what I call the orphan arts and making a museum for them. 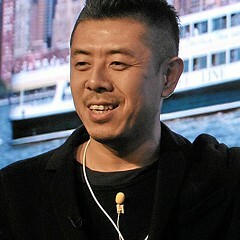 A very avant-garde Chinese architect [Ma Yansong of MAD Architects]. Will it have a spacey look? It's going to be organic architecture. Not a square box. In terms of the things you've done with your life where do you put this? I have a one-year-old daughter, so this is the second most important thing in my life right now. I think it's time we have something of significance [for this kind of art]. The Metropolitan Museum in New York has some Rockwells. They just don't ever display them. Friends of the Parks makes a federal case of the proposed lakefront site. 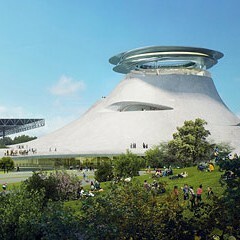 But the Chicago Park District wants your input on the Museum Campus.